Made with high-performance materials, the Polyco Grip It Oil C5 is a seamless knitted cut resistant glove liner with a dual nitrile coating. 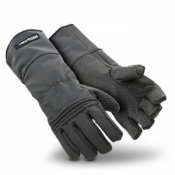 The gloves feature the highest cut resistance protection on the market and have even exceeded the EN388 standard blade cut testing, and are also highly tear, puncture and abrasion resistant. 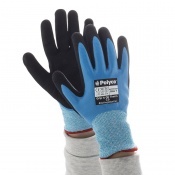 The Polyco Grip It C5 gloves are made from a combination of high performance polyethylene (HPPE) and glass fibre, providing a high level of resistance. The liner attains maximum EN388 scores in all categories, including Cut Level 5. On top of this liner, the C5 is engineered with two layers of nitrile coating over the polyethylene and glass fibre materials to provide ultimate protection and optimal grip. The first layer, which is a full coating, is soft and resilient ensuring the wearer can perform tasks with optimal dexterity. 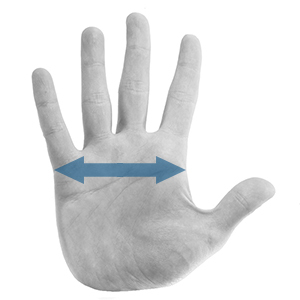 The second layer, which is a palm coating, is infused with microfoam bubbles (which can be seen in the image below) increasing resistance to oils and maximising grip, these features even work in wet and oily conditions. The Grip It Oil C5 are designed for maximum visibility. The gloves' florescent yellow and green increase the visibility of the gloves when dropped or when being used in poorly lit environments. 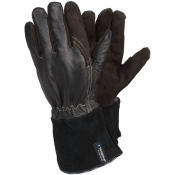 Please note that this list is not exhaustive, the Grip It Oil C5 Gloves are well suited to a number of other tasks and industries, this is a guide designed to aid in product selection. 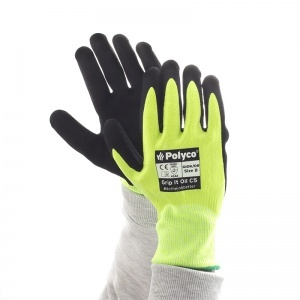 The Polyco Grip It Oil C5 Gloves are latex free.